Life is a dance! As someone who got into ballroom dancing a little bit more than a year ago I thought this would be a great comparison. How would you emotionally and mentally benefit if you would treat your daily challenges as a dance rather than a disaster? Sometimes things go wrong and we don’t get the expected outcome. So what? Learn from it, find a better way and move on! It is not the end of the world. If you want to achieve great things, you have to take risks and there will be setbacks along the way. Your mindset and attitude is crucial. This is an important part of the process. The majority of people in the manufacturing industry love to solve problems. Solving problems is part of their excitement working in the job. The only things that often seem to get in the way are daily frustrations and stressors. It matters how managers and the workforce tend to look at and handle these roadblocks and the people around them. If people are not aware, it is all too easy to get into the habit of describing every setback as a disaster and then the blaming game is on. 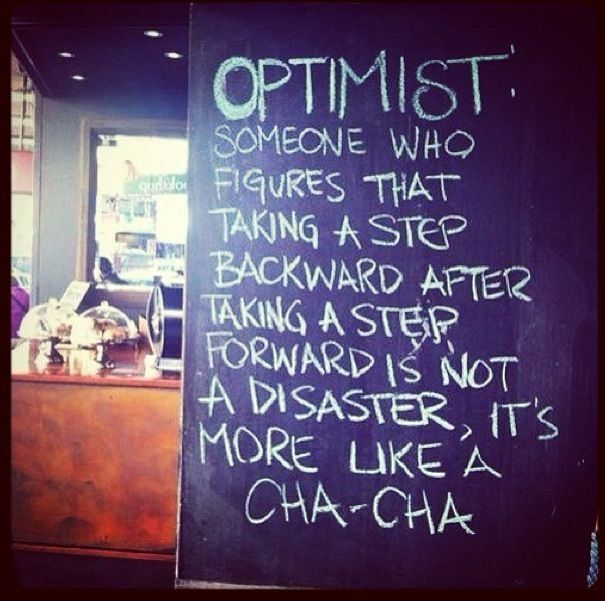 Learn to handle setbacks with grace, never give up and get into a “cha-cha mindset”. Optimists always look for the best in any given situation. If you start doing this, you will notice a huge difference in your overall life experience. Optimism is a choice.